Morgan Shamy: Demons. Fate. Remake. And while I definitely have my own personal opinions, I wanted to throw some thoughts out to you, wanting to know what YOU believe. Do you believe in fate? That you’re destined to do things? That there are things on this earth that only you are meant to accomplish? Or do you think the opposite? That everything we create and make of ourselves is determined only by us. That only we can pave our own paths. That there are such things as coincidences. Or is there a combination of both extremes? I don’t mean to get all deep on you. But I’m fascinated by the topic, and I really would be interested to know what you think. Would you share your thoughts? And if you don't feel like being open, you can just comment on how jealous you are that *I* have a copy of Ilima Todd’s REMAKE!!!!! I got a copy of her ARC yesterday and I’m FREAKING to read it! I'm going to start reading tonight!!! In other news, I just finished beta reading a FAB book by Kyra Lennon, so keep that on your radar--look for an announcement from her soon. And Jolene Perry also has a new book out under her Mia Joseph's pen name, called, Blurring The Lines, which is SO FABULOUS. And Julie Musil has a guest post coming next week that you will all love! Anything else worthy of report? I do not believe in fate or destiny. Or "one true soul mate"s. Coincidence is often just a matter of perception, just like "randomness," which doesn't much exist. I believe in a bit of both....but you probably already knew that ;) So glad that we can take control of our lives, but also grateful that fate steps in and helps us out in times of need! Fate? No. I don't think anything is predetermined or "meant to be". I think there are infinite options that could work out great, and infinite options that could be terrible. I DO think we get father when we understand ourselves, both strengths and limits. Having natural skills and talents is a lot different than fate, I suppose. I have absolutely no idea if I believe in fate anymore. I used to for sure. It's not that I don't believe, I just... don't know anymore lol. I'm somewhere in between. i believe there are things only we can do, because God created us and gave us those abilities. I don't believe in Fate. I guess I hate the idea that I don't have a choice, am pinned down to something. I'm so excited for Ilima's book! Be sure to post about it, okay? When it comes to fate, God already know what we're going to do, but we're still the ones who decide to do it. I believe it's a bit of both. There are things only we are meant to accomplish, but we can't expect to see them without serious commitment and work. We have freewill, which is both a blessing a curse. Our lives are what we make it. Let's say somewhere in between. I believe that we shape our own fates. I mean, we're not gonna become famous writers by sitting on our butts doing nothing, right? Fate doesn't just come fall in our laps - we have to do something about it, and often that means working really hard for it. I feel like I'm destined to do/have certain things, but also that it's my responsibility to make those things happen. Few things simply fall into my lap. I look forward to reading more bloggers' books. I believe in Fate coexisting with Free Will. Though everything is predetermined, we were still given the agency to make our own decisions. It's up to us if we choose right or wrong, and even if we make the wrong decisions, it's not really a mistake or waste if it gets us to where we are now, and we learn from it. The oft-repeated maxim of Dr. Pangloss in Voltaire's Candide is so true, "All events are linked together in this best of all possible worlds." Everything has to come together in exactly the right way for future events to be possible. I'm hoping to have physical copies of my two released books sometime this month. Maybe then I'll finally see more than pathetic dribs and drabs in sales. So interesting reading everyone's responses! I fall more on the "life is what we make it" side of things, but I like the concept of fate, which is probably why it crops up in my writing so much. While I don't think it applies so much to my life, I love the whole "what if" that surrounds it! I don't know if I believe in fate so much as I believe in potential. (And maybe they're the same thing.) I think we are all born with a certain unique "potential" to achieve and do certain things should our lives align with them. Where that potential comes from is probably based upon your own beliefs (maybe it's endowed by something spiritual, maybe genetics, etc.). I could easily say that it was fate that brought my wife and I together. We'd literally been around each other's families our entire lives yet never met until we ended up working together in the same small office on our college campus. But maybe there was just this potential inside of us (because of past experiences, similarities in our personalities, etch) that was instantly realized when we crossed paths. So many things could've interfered in that encounter, but they didn't. I'm reluctant to completely embrace fate, because I don't think it universally applies. Some things are just unfortunate in life. Car accidents, sickness, and other things just happen. If I didn't believe that, I'd live afraid or completely recklessly because nothing I did would matter. And I don't know how I could attribute only the good things to fate. So I'll chalk it up to there being a tremendous amount of potential for both good and bad things to happen, and sometimes the randomness of time, space, and life come together for that to happen. I think this ate my comment again. I swear, it's like the internet doesn't want me to talk to you. Well, too bad for you internet! Just in case the comment exists somewhere else, I won't repeat myself. I'll simply say that I believe in both. We are unique and our imprint matters. But we have to choose to embrace that uniqueness and act on it. I've often thought: what if The Father made a person just for you to be your mate, and you foolishly couldn't wait and chose the wrong person? What became of your perfect mate? Did she/he live life alone or with someone who didn't quite fit their heart? What if He made the perfect job for you, and you thought it too hard or too distant? What would become of your life? I believe our lives are composed of our mistakes and our correct choices. Being human, my mistakes outnumber my correct choices. Does the Father make the best of what we have made of his gift? Our fate is indeed in our hands but was there a grander plan we could not see or work for or wait for? I love that photo of you! So adorable. Here's my take on your fate question: I believe we're blessed with certain gifts, but it's up to us to nourish and use those gifts. I think too many people leave this earth without having tapped their true potential. Keep those deep questions coming...I love them! I completely agree with Roland above. Love your thought provoking posts, darling. Gah, I haven't updated my blog in a while. Just haven't been feeling it. You're looking beautiful, as always, my friend! just a good question morgs! I believe that you do all you can and let God make your path as you steer yourself correctly down HIS path. I think there is definitely fate...in a loose concept of it. I don't believe, quite honestly, that it's 'written down' somewhere. I believe that if the universe did come from the Big Bang, that if another universe started from the EXACT same Big Bang with the exact number of particles and space and compression and EVERYTHING exactly the same, that universe would have the same exact person editing the same word in the same exact novel at the same exact time. Meaning, every action is a result of some previous action. So, I guess, it is predestined. But it's predestined to such a complex and random and confusing degree that it can almost basically be said that there is no fate, just to make it simpler (even though there is fate). Does that make sense? I believe in both fate and we making our own decisions. I believe that I'm fated to be a writer but also that it's my choice to pick up a pen and get cracking. So jealous you have a Remake Arc. Go have fun reading it Morgan. I tend to believe 50/50. We have a potential destiny, but it's up to us to embrace it, or choose another way. Ultimately, there's a path that will make each of us the happiest, but not everyone wants to conform into that path. I'm in the half and half camp, as well. I think there are certain things we are just meant to do....find our special someone, be an example (good or bad), touch other's lives....and things we are possibly meant to do. We are given opportunities and I think destiny takes a back seat to our free will, at times. AW! 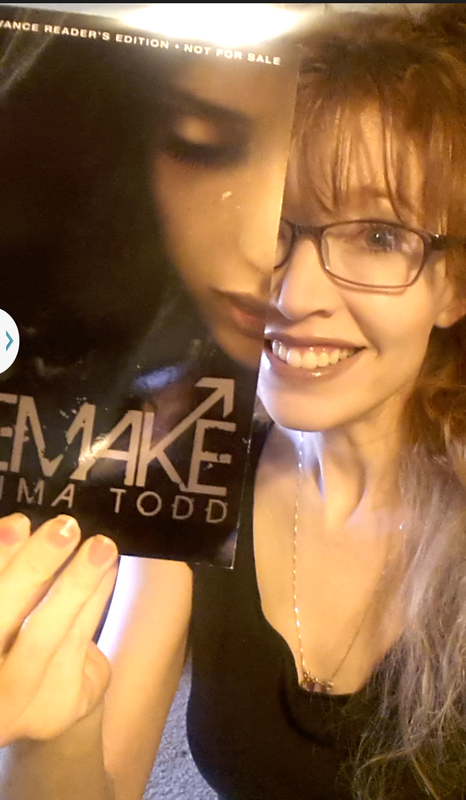 You get an ARC copy of Remake! I am envious. I think what I believe in might sound like fate but isn't. I believe in God and that He has given each of us tasks meant for us to do and no one else. You know, I do kind of believe that we have a fate, but I also feel that a lot of the time it's up to us to stay on the right path. If we give up on our dreams, so will the fates. I really like the song "Demons" too.